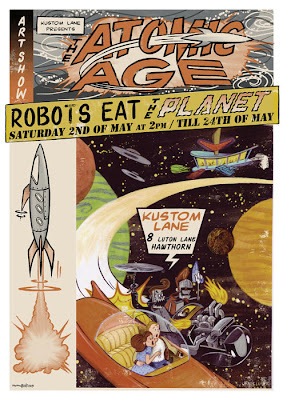 Here is a poster I did for the upcoming Kustom Lane Show THE ATOMIC AGE, it opens Saturday 2nd of May at 2pm in the arvo and it's on till the 24th of May, so if you can't make it to the opening come some other time, there will be copies of the poster for sale with other bits and peices I am doing for the show. 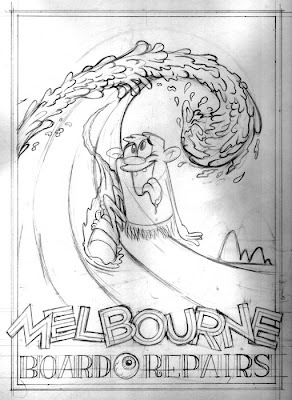 I've been drawing heaps of stuff but I can't show it just yet, It's got to do with surfboards... well.... you can take a look at these pencil drawing but I have changed Palazzi the surf NAZI a bit in this bottom drawing, the legs were looking funny.... so I changed them (you'll see when I post the inked versions. 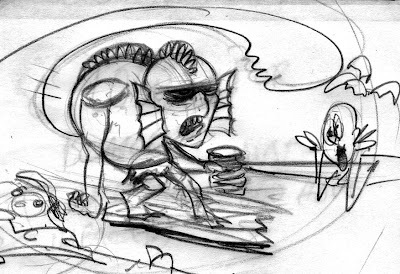 And here is a little sketch for a board that is supposed to be called "THE FREAK" but I've got this idea about a mutant surfer so maybe we could call the board "THE MUTANT" we'll see. 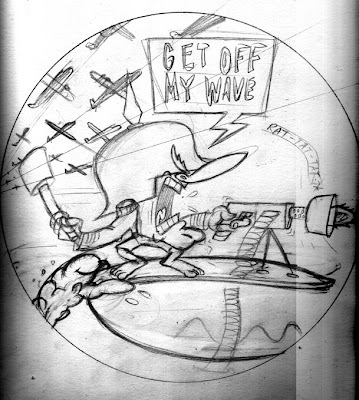 Later on I'll post the paintings I've done for the Kustom Lane exhibition, I've got them drawn out but I still need to paint them, so stay tuned! !